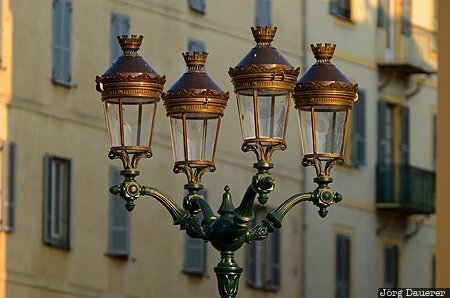 A glorious street lamp in Ajaccio illuminated by warm morning light and the facade of a house in the background. Ajaccio is the capital of the mediterranean island of Corsica, France. It is in the department of Corse-du-Sud. This photo was taken in the morning of a sunny day in September of 2011. This photo was taken with a digital camera.